My favorite: the “gentle knock” segments throughout this book. Throughout WHAT ARE YOU WAITING FOR? Kristen Moeller offers these life-searching, self-reflective questions. 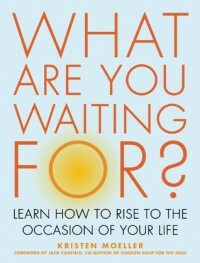 If you read nothing else of this book and just take these questions to your daily meditation, you’ll become a better person—perhaps, the person you’ve been longing to become. But, I encourage you to read the rest of this book. Moeller shares her deeply personal story: surviving melanoma; beating addiction; and then, losing everything. She carefully tells us about life’s perceived dependencies and boundaries; she opens up the gates through kind guidance of thought. Nothing is rushed or forced: all of it is within us, waiting to be recognized, accepted, and acted upon. Moeller’s description says she is a “self-help junkie”. Yeah, that shines through. No, she doesn’t offer her sources or make other references (though I would have liked her to). Her writing and philosophy remind me of the lessons I’ve learned from some of these other great books I’ve read: HARDWIRING HAPPINESS, DARING GREATLY, NEVER EAT ALONE, ESSENTIALISM, and the fictional (but outstanding) THE ART OF RACING IN THE RAIN. 1) Go out into the world. 5) Look for what needs healed. 6) Forgives your (and others!) humanity. 7) Thank God for the process and opportunity. 9) Repeat steps 1-8 until the day you die. Also interesting is the author’s opposite take on THE SECRET (though she doesn’t call it out directly…I know!) and America’s fascination with the Law of Attraction. Even a SIMPSONS episode called it out. Let’s drop our obsession with stuff and live an authentic experience. Let’s rise to the occasion of our lives. Thanks to Cleis Press and Viva Editions for reaching out and offering a copy of this book for my review. The personal story and introspections served as a great reminder and gentle prodding. Thank you, again.